Air Intake Louvres are installed in the tower air inlet to act as barriers for debris, water splash-out, noise, and sunlight while improving airflow and overall tower appearance. 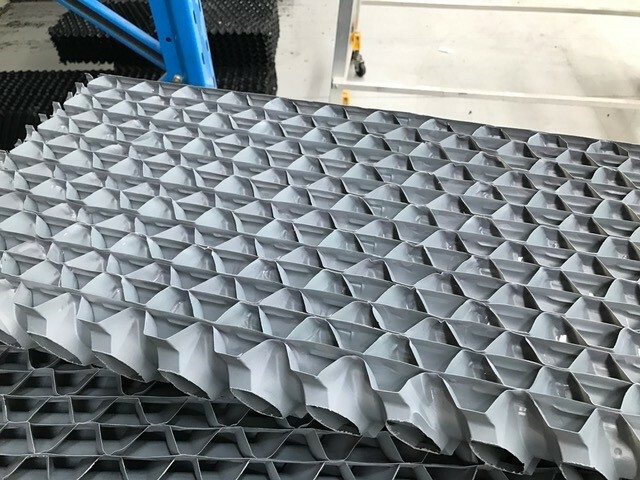 We provide cellular and blade type louvres, which are designed to improve air flow into the cooling tower, eliminate water splash-out of falling water from counterflow cooling towers, minimise icing problems, reduce light transmission into the tower and reduce sound transmission out of the tower at minimal airside pressure loss. Total sun blockout controls the amount of sunlight into the cooling tower to reduce algae growth. Rigid, UV-stabilised PVC meets Cooling Technology Institute (CTI) Standard 136. Contact us to for sales and service.